By 3 years of age, all primary teeth should have erupted. All these baby teeth will be in place for the next 3 years before a series of baby teeth start to "exchange" for a corresponding set of adult teeth. 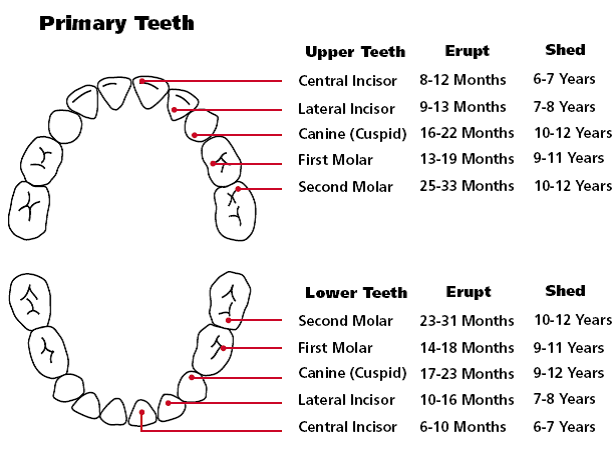 We will discuss this exchange process at AGE 6 dental visit but in the meantime, ages 3-5 baby teeth should look like the below photo. Keep them clean and cavity free!! By age 6, the first adult tooth should appear behind the lower second molar. Three-year-olds should not be expected to accept separation from their parents for restoration treatment procedures like getting a cavity filled. This is because most 3-year-olds are not socially mature enough to separate from parents.